How to open and close telescopic rod? InterLine rods designed with the latest revolutionary technology utilize the incredible High volume fibre carbon, combining precise resin control with unidirectional graphite fibre to make one of the lightest, strongest and most sensitive blanks. Using every component with graphite, specialized composites and customized components matching and enhancing the properties of each to produce a fine diameter blank that resists twisting, eliminating blank stress, creating better casting accuracy, even smoother drag pressure and greater hook setting power. The guideless blank allows for longer casts, superior action and the strength to overtake hard-fighting species. Interline rods bend evenly, no stress points provides maximum blank strength, they have 360 degree axially symmetric tip which is completely tangle free and provides equal performance at any angle. Linear Interline guide structure with the line runs inside the blank, is integrated inside the blank, no guides to provide torque stress points, with many contact points torque and friction is reduced, no extra weight, the blanks true action is optimized, no tangles, no guide breakages, even line control with convenient no tangling storage. Line is distributed evenly along the entire spiral structure, decreasing torque, providing smoother retrieves, friction free casting and ultra smooth even drag pressure. Decreasing line contact and drag thus increasing cast distance and accuracy by drawing water off the line and keeping the line centred in the rod. By increasing the amount of spirals and deceasing the spiral peak, interline rods have become inherently more sensitive. These are the coolest, funkiest and sexiest most technically advanced rods available. This rods are suitble for all weather espeicially windy or rainy. Whether you'll be targeting Bass, Pike, Carp, Trout, Salmon, Striped Bass, Rudd, Tench, Redfish or Chopper Blues, these rods will help you to hook and land it. The line go inside through the guides located inside the rods. The rods is special designed With carbon thread inside to make sure the line go smoothly and will not touch the rods side tightly. Ensure the line will not scratch with the rods. The reel seat is located closer to the bottom; this will make the balance perfectly. Angler can feel more relaxed when using the rods. The steel wire is for help the line go inside. One looped side connect with the line and another site insert into the rods guide. Pull wire straight through the tip top and when the fishing line go out of the tip guides disconnect the line and the wire. Store the wire for next use. 2.7 meters Daiwa IL Hokage 120-270 InterLine almighty rod with a flexible tip bias designed with the latest advanced technology including the Super water-repellent dry to repel linear structure that float inside the thread of the rod, a drop of water, top-in structure from pole to put the destination thread, release the performance of the line that is often seems to insecurity, has reached the level of no compares favorably with guided rod not an exaggeration. Adopt a simple "top-in mechanism" in setting the time further, good portability of the drawer type only some important points. Rod bends evenly, no stress points provides maximum blank strength, it has 360 degree axially symmetric completely tangle free tip which provides equal performance at any angle. More about IL-Hokage-120-270 Interline rod. Brand new 3.1 meters interline rod, very light, 300g, easy to carry, collapced to 111cm. 3 telescopic sections easily extend from 3.7ft to 10.3ft. The rod is made of High Modulus carbon combines precise resin control with unidirectional carbon fibre manufactured by Daiwa, using their best Design, Engineering and Technology. Superior sensitivity make this rod suitble for all weather conditions espeicially windy or rainy. More about FUNE-IL-V73-80-310 Interline rod. Brand new 3.5 meters Daiwa InterLine rod IL Seaflex 64 80-350 is superior to bite, Muchingu action stickiness, flexibility and tenacity to live. Reel seat adopts the "V grip sheet" easier to fatigue grip. Tip adopted a strong inner diameter 3.0mm type also in trouble on the right stop and dust clogging. Interline (medium through) the tangle to the guide, to eliminate the trouble of Sabiki such as multi-point needle gimmick, provide a comfortable fishing. 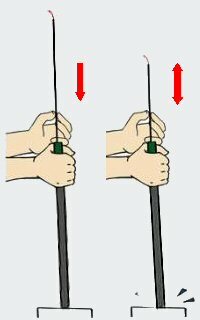 It is possible to stretch the rod while setting the hook, make it very useful moving up to get on the boat. Tip can be adopted smooth line release the linear interline spiral structure. More about IL-Seaflex-64-80-350 Interline rod. Brand new high performance interline rod, 3.5 meters length, light weight, 315g, collapced to 96cm, easy to carry. 4 telescopic sections easily extend from 3.2 to 11.7ft. The rod is made of High Modulus carbon combines precise resin control with unidirectional carbon fibre manufactured by Daiwa, using latest design, engineering and technology, including Drawer TOP-IN interline, Through one-shot thread, V grip, prevention stopper. More about FUNE-IL-V64-80-350 Interline rod. Brand new 3.3 meters interline rod, extra light weight 185g, easy to carry, collapced to 117cm. 3 telescopic sections easily extend from 3.9ft to 11ft. The rod is made of High Modulus Graphite carbon combines precise resin control with unidirectional carbon fibre manufactured by Daiwa, using best design, engineering and technology. More about MINIBOAT-V-30-330 Interline rod. Brand new 5.15 meters interline rod, easy to carry, collapced to 121cm. 5 telescopic sections easily extend from 4ft to 17ft. 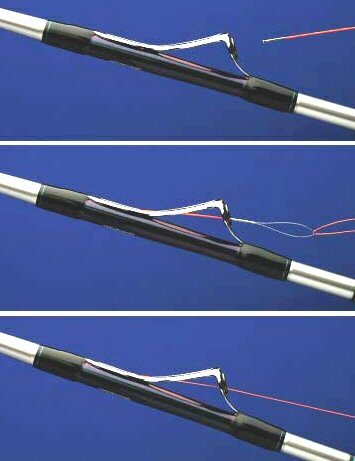 Very powerful sencitive rod corresponding to Fukase fishing from shore wave with an excellent High-level capabilities. Rod designed with the latest revolutionary technology utilize the incredible High volume fibre carbon, produce a fine diameter blank that resists twisting, eliminating blank stress, creating better casting accuracy, smoother drag pressure and greater hook setting power. Technology includes durable water-repellent inner dry processing, when water droplets inside the rod contact blank at 165 degrees angle and easy roll down with drainage performance. More about IL-PROGRAND-4-52 Interline rod. Brand new 5.25 meters interline rod, collapced to 113cm, weight 230g, easy to carry. 5 telescopic sections easily extend from 3.8ft to 17ft. It is a powerful standard model of Isogami rod corresponding to Fukase fishing from shore wave. It has an excellent High-level capabilities (far throw 1-3 section) Mochiomori with few feelings in the low center of gravity design. Rod designed with the latest revolutionary technology utilize the incredible High volume fibre carbon, produce a fine diameter blank that resists twisting, eliminating blank stress, creating better casting accuracy, smoother drag pressure and greater hook setting power. It is equipped with super water-repellent inner dry processing, contact angle of water droplets and the object 165 degrees of surprise. Rod is very sencitive and flexible, it can be used to smooth (5g or so) delicate light and float mechanism. More about Daiwa PRESSA-DRY-2-52-ENTO-F Interline rod. Brand new 5.25 meters interline rod, easy to carry, collapced to 113cm. 5 telescopic sections easily extend from 3.8ft to 17ft. It is an expedition model to demonstrate the power of the big game island fishing. It has an excellent High-level capabilities (far throw 1-3 section) Mochiomori with few feelings in the low center of gravity design. Rod designed with the latest revolutionary technology utilize the incredible High volume fibre carbon, produce a fine diameter blank that resists twisting, eliminating blank stress, creating better casting accuracy, smoother drag pressure and greater hook setting power. It is equipped with super water-repellent inner dry processing, contact angle of water droplets and the object 165 degrees of surprise. Rod is very sencitive and flexible, it can be used to smooth (5g or so) delicate light and float mechanism. 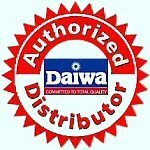 More about Daiwa PRESSA-DRY-3-53HR-F Interline rod. Smooth bending curve - Interline rods bend evenly, no stress points provides maximum blank strength, unlike guided rods which create an uneven segmented curve with high stress points. 360 degree axially symmetric tip - completely tangle free and provides equal performance at any angle, standard tip guides tangle easily and to get full performance they must be used at the same direction as the line. No external weight - normal guides add weight, thus the action of the blank is degraded, Interlines guide structure is integrated inside the blank, and no external weight means the blanks true action is achieved. Torque free - the line is located inside the blank, no guides to provide torque stress points, with many contact points torque and friction is reduced, normal external guides create high friction and torque reducing the life of the blank. Linear Interline raised spirals - line is distributed evenly along the entire spiral structure, providing smoother retrieves and ultra smooth drag pressure. No guides - no tangles, no guide breakages, even line control with convenient no tangling storage. Extremely high sensitivity - with up to 200 linear contact points directly onto highly sensitive carbon, Interlines are inherently more sensitive compared to standard rods, guides are made of materials that absorb vibration "dulling" line sensitivity. No slack line - standard guided rods can have up to 30 cm of slack line due to the segmented guide distribution whereas interline provides completely even line distribution, even the subtlest of bites are felt and strikes are instantaneous. How to operate Interline rods. Line feeded directly through the rod blank, using an integrated structure within the blank to act as a set of internal guides. These guides hold the line clear of the blank wall, reducing friction when casting and allowing the smoother release of line for longer more accurate casts. Insert straight end (not looped) of the wire into the guide. Insert line into the loop at the end of the wire and fold back. Pull the wire straight through the tip top. Coil and store the wire for future use. Knots are unnecessary and may interfere with smooth threading. If resistance occurs do not force through. Simply remove and start again. The tip section has small diameter and leader knots can get entrapped inside the blank. For larger leaders keep the leader knot outside the blank. Entrapped knots or line can damage the tip section. Interline rods are highly suited to braid and PE lines, these lines require monofilament leaders and thus leader knots. For optimal performance Interline knots require ultra slim knots for easy line flow. Common leader knots like Twisted Leader Knots and Double Uni's are sufficient but the PE Leader Connection knot for connecting leaders to braided lines for maximum interline performance is suited best. For maximum knot strength apply a quick dry super glue to the knot. Uncover and remove the top cover along a line, otherwise it may break the fishing rod. Drill the fishing line through the bottom sections to the top through every section. If the fishing line is in disorder, don't draw the line forcibly. 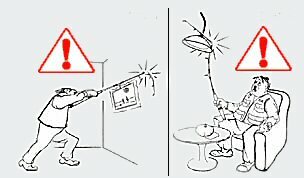 Dragging too forcibly on any point of the fishing rod may result in the break of fishing rod. Make sure to open the rod from the tip to bottom section one by one tightly and don't apply any sideway pressure, so the sections can not move when twisted. Extend each section individually and make sure it's snug but not too tight before moving on to the next section. Do not apply too much pressure when pulling sections out as that could cause pieces to get stuck. Fix the fishing line reel, pull out the line and drill it from bottom to the top. Z. 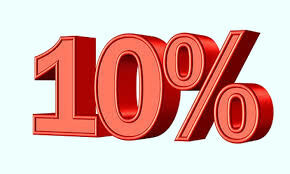 If nothing helped buy another rod from our website AllFishingBuy and take more care of your fishing gear in the future! Do not use any substitute materials or wire instead of wire designed to operate with this rod. 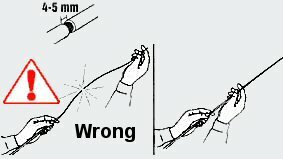 Do not kink, bend abruptly or otherwise abuse the threading wire. It could damage the rod. Always use the recommended knots for connecting leaders. Do not brush inside; this may damage the inside of the rod. Accumulated water can be removed by whipping the rod. After use rinse out the inside with freshwater and whip the rod to remove excess water. Dry before storage. Do not apply oil or lubricant to the inside of the rod as this will impedeline flow. Washed the exterior of the rod with freshwater after use. 4. Be extra careful when getting your graphite fishing rod out of the car. Too many people break their rod on the car door. 10. Never use brush, toothpaste, gasoline, dope and other organic substances to clean the fishing rod, it may occur damage to rod surface and even the rod itself. Don't clean the rod by steel brush. You shall gently remove the dirt, any remaining "fish stuff" or salt by towel, soft brush or cloth dipped with a little soap and water, and after it is dry completely, brush up with car wax or leather. This will make it easier to clean and help preserve the rod's finish. Wiping the rod down with furniture polish after each use is a good way to keep it looking its best.